The path for developing a successful, self- sustaining career as an artist is seen by many students and aspiring practitioners as a fabled pursuit, where prosperity is held by a select few. A strong vision and a dedicated practice are necessary to develop and balance the quality of the work with the business of making money from your craft. No one will tell you that making a life out of your passion for making will be easy, but we can learn greatly from the advice of veteran professionals. 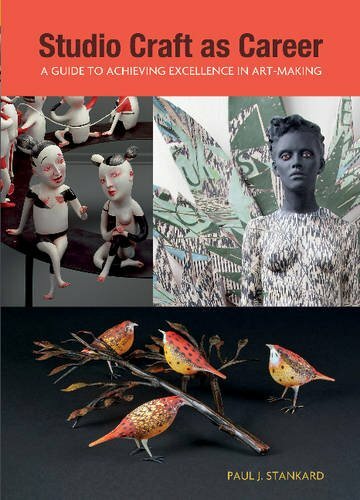 In his recent book, Studio Craft as Career: A Guide to Achieving Excellence in Art-Making, Paul Stankard gives an intimate record of his journey as an artist. Most people with a knowledge of the “glass world” are familiar with Stankard’s mesmerizing tromp l’oeil paperweights depicting pastoral dioramas. However, many are not familiar with the artist’s journey. With no formal art education, Stankard left a career in the scientific glass industry to pursue a passion that had much less security. He carved out a path and a lifestyle that has provided him a successful career and an optimistic outlook on the potential for others to follow their dreams in the craft field. The first half of this book is the story of Stankard’s personal journey as an artist who broke away from the trappings of a secure career to follow his bliss as a curious maker. Stankard uses his own experiences as a means for proposing a professional approach to developing both life and career as an artist. Through explanations, at times derived from unlikely facets of his life, the author describes his professional growth. Stankard swiftly moves through subjects, from developing his artistic vision to creating and maintaining commercial viability. There is a professorial tone to Stankard’s storytelling throughout the book. This is not a text based on providing answers. In fact, “guide,” as used in the book’s title, may not be the right word. 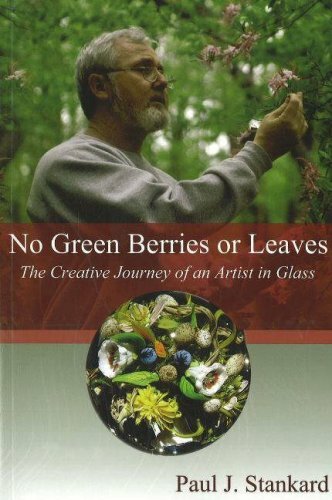 This is a book of wisdom from an artist and educator with experience. Stankard’s accounts are humble and meaningful, illustrating the points of inspiration, life, and practice that have provided him success. The deeply personal tone will not resonate with all audiences. Although it speaks to life’s many teachable moments, younger readers may feel disconnected from some of Stankard’s stories, as they are specific to his life experience. Steeped in nostalgia, Stankard’s perspectives are reveries of his life’s path. These recollections range from childhood memories to meeting iconic figures of the Studio Glass Movement. Each story, in almost biblical fashion, has a lesson that is embedded in the retelling. Intimately described, Stankard recalls both the challenging and rewarding moments that led to his personal and artistic maturity. as James Joyce and Walt Whitman that provoked and inspired romanticism in his portrayals of plant life. The second half of Studio Craft as Career features a range of contemporary craft artists, spanning practices in glass (which accounts for approximately half), ceramics, wood, metals, and so on. The visually enticing images are sampling of work from each of these high-caliber artists, many in the prime of their career. Along with their images, Stankard places the artist, their work, and their career in perspective with a synopsis of their approach and impact on the field of craft. work and the breadth of craft practice. The overarching demographic of these contributors are capital “C” craft artists, with practices steeped in formal, material- based approaches. A few artists, such as Lauren Kalman and the de la Torre Brothers, whose approaches push the boundaries of a mainstream craft practice, augment the group. Stankard’s selections skim the surface of the wider and more contemporary voice of the craft world, including predominantly white American artists. Studio Craft as Career is an autobiographic work of prose where the author’s experiences serve as a model to composing a life and living as an artist. Stankard’s perspective on the development of a career in studio craft is humble, encouraging the next generation of artists to take a conscientious approach to making and living. His account describes a path to success developed out of vision and good old-fashioned hard work. An obvious tone in the pages of this book is that success comes from a dedicated practice and a realistic strategy. Through the story of his career and the accounts of many successful craft artists, Stankard illustrates that a successful career is kept by those who keep working with tenacity, curiosity, and a positive outlook. Michael Hernandez is an artist and Associate Professor at Palomar College in San Marcos, CA. A few years ago, while traveling to a regional conference, my host and I ate dinner at a local restaurant. Our getting-to-know-you conversation centered on woodturning (of course), and at one pint he asked, "Should I call myself an artist?" Wow, that was a loaded question. Labels matter, inwardly and outwardly. For a variety of reasons, his question fascinated me - it still does: Was he asking for permission to be creative from others or for himself? From what stimulus did the question arise? Does he understand the significance of labels? After reading Paul Stankard's book, I now would have a better response, starting with recommending my host read Studio Craft as Career, specifically the chapter, "What's in a Name?" where the author writes about why labels matter. 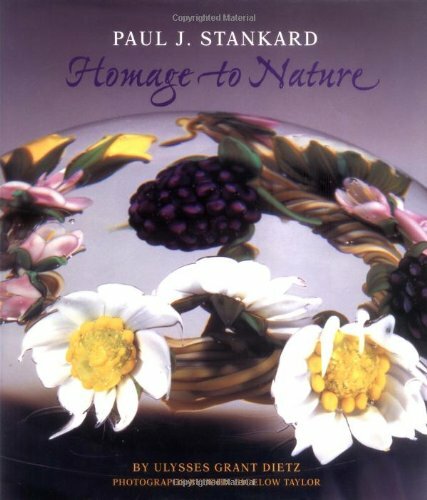 Throughout the book, Stankard shares stories about his life's journey - from making glassware for the medical industry to becoming a world-renowned glass artist, and from discussing intellectual topics of interest to craft artists. He writes sparingly, and his straight-forward, conversational prose made reading this book seem as though I was having a gentle conversation with an old friend. Each personal story brilliantly supports a chapter's title and concept. Part 2 of Studio Craft as Career, Artist Portfolio, is devoted to forty-eight other artist, two pages each. Stankard writes "An Appreciation" of the artist on the first page, and each maker offers "Advice to Artist" on the second page. Three images of the artists' work accompany the concise text. Woodturner and carver William Hunter writes, "Bring what you love and what inspires you into the pieces so your passion and voice are what communicate through the work." As the title indicates, there are many guideposts for craft artist in this book; perhaps the most compelling for me, when considering my role as a demonstrator, is Stankard's story about wanting to learn how to recreate "the Millville Rose paperweight design at the torch." instead of being frustrated or upset about his colleagues's secrecy concerning his methods, materials, and techniques, the author realizes, "If he had given me step-by-step instructions, it might have weakened the motivation for me to create my own style." The woodturning field has flourished because we so freely share techniques, materials, and processes. What our field needs now, though, are makers who set aside this plethora of ste-be-step instructions to venture nto the realm of uncertainty where personal style can emerge. Offered within this book, through chapter titles such as, "Who Need Education," "How Our Perceived Limitations Can Become Our Strengths," and "What Labor Has Taught Me," are excellent insights to help guide you throughout your journey of uncertainty. An added bonus is the quality of the book itself. The heavy paper exquisitely showcases the many full-color images of the artists' artwork. Most of the work is breathtakingly lovely; a few are challenging to appreciate. In chapter 2, "Crawl Space," Stankard tells the story of culling his "set-aside" pieces from his early years of making. Like that exacting process of elimination, it is obvious that Paul Stankard did the same with his book: Only the best is left, in words and images. A resource that strives to inform, inspire, and motivate all who work in craft, whatever the medium, and wish to improve the creative expression of their work, whether via college-level or other formal art and craft programs or self-directed learning. While the book features flame worked glass and a selection of the leading artisans who do this work, the insights and recommendations presented herein transcend material and speak to broader issues relevant to all creative craftspeople. 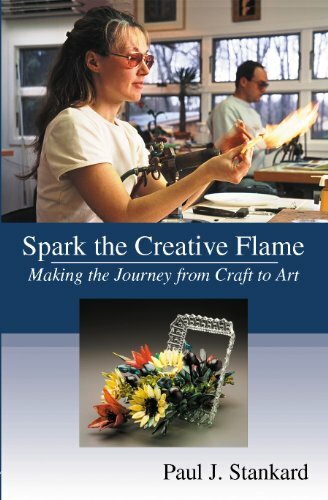 I recently read Paul Stankard’s new book, Spark the Creative Flame, Making the Journey from Craft to Art, while making a journey from Chicago to Asheville to teach at Penland School of Crafts. Three hours after opening up the modest paperback, I had devoured the book and found myself contemplating the growing field of flameworking. The book covers a lot of ground for the reader and is divided into three sections: commissioned essays, personal experience and philosophy, and artist appreciation. Its expansive scope is meant to address the many different facets of being an artist, as Stankard sees it. The tone of the writing feels personal, as if a story was being told to you, yet it conveys an impressive amount of information. The first section consists of three commissioned essays by jewelry artist and critical spitfire Bruce Metcalf, art history scholar Burton Wasserman, and stained glass guru Judith Schaechter. Both Metcalf and Wasserman’s essays are essentially primers to concepts in studio craft, but Scheachter’s essay “What is Beauty” stands out as the most provocative of the three. Schaechter uses humor, wit, and accessible language to unpack and explore the complex subject of beauty. It is gratifying to see one of Scheachter’s essays, from her self-published blog, Late Breaking Noose, in print. The inclusion of this essay was a knowing choice by the author, as it helps contextualize Stankard’s notoriously beautiful paperweights. The “experience and philosophy” section charts and illuminates Stankard’s creative path and his well worn work habits. This section gives the reader a glimpse into an artist’s life; you learn about Stankard’s journey to teach himself flameworking and his numerous failures, side jobs, and challenges with dyslexia. Ultimately, his process is reflected in the tone of the book itself – his work is derived from his curiosity about nature and humble work routine. In the “artist appreciation” section, Stankard profiles a diverse range of contemporary flameworking artists and, to my surprise, many interesting narratives emerge. You learn that several Italian artists like Lucio Bubacco, Cesare Toffolo, and Vittorio Costantini opted to be flamewokers, because they were dissatisfied by the strict hierarchy around furnace work in Murano, and saw flameworking as a more expressive medium. Lucio Bubacco recounts that because he was from Burano (Murano’s sister island where lace is made) he could never become a maestro. The reader finds an impressive amount of women, who are at the top of the flameworking field. Some of the strongest work included in the book is from Kari Russell-Pool, Amber Cowan, Carmen Lozar, Ginny Ruffner, and Anna Skibska. The artist profiles are almost half women – a surprisingly rare occurrence in any book about glass – but given the success of the predominantly male pipe world, it’s refreshing to see Stankard recognize that these artists are already pushing boundaries within the studio glass context. Although only one pipe maker, Matt Eskuche, was included in the “artist appreciation” section, Stankard writes a soliloquy to the pipe community on the final page of the book. He states that there is a “growing number of artisans… flameworking borosilicate glass into functional, decorative paraphernalia.” And believes that they “have strengthened the flameworking community, making it the most energized segment of the glass world.” Once you get to that last page, it is no secret why Stankard reveres this subculture of artists. He is a champion of the autodidact and believes that “figuring it out for yourself” can lead to innovation; he knows that the best artists follow their passion, and – as is evidence in all the artists featured in the book – you never know where your path might lead, or what experiences will inform your practice. Essentially, Stankard sees pipemaking as a gateway to thinking about art, and he wants to feed that impulse. A collection of autobiographical essays through which the author presents his life as a struggling, then highly successful, artist; reveals insights into the challenges he faced as a dyslexic and how he came to understand, then circumvent, his disability; and records his perspectives on the history of the studio glass movement in America as he witnessed and experienced it during the past fifty years. With 180 of his works illustrated in color, as well as, photographs showing the preparation and assembly of the pieces. This is a study of the glass art of Paul J. Stankard, who is known especially for his paperweights. 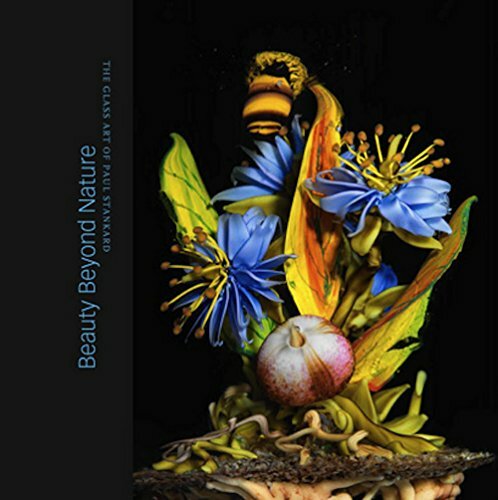 Stankard paperweights are all unique; encasing roses, lilacs, orchids, and fantasy flowers created from spun filaments. There are also bees and damselflies, glistening raspberries, and root people - tawny colored creatures made to resemble living plant roots. Even more complex are Stankard's Botanicals - upright cloistered glass forms, often displayed in diptych and triptych formations.